We have been collaborating with RS Components to put together a demonstrator “laptop radio” with full SDR receive and display capability. This is a good way to introduce newcomers to the world of Radio Communications and an exploration of the wireless spectrum. 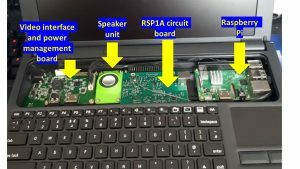 We took the popular Raspberry Pi based Pi-Top laptop computer to see if we could easily add an SDRplay RSP to it (see https://pi-top.com/products/pi-top to find out more about the Raspberry-Pi based modular computer designed for educational and developer use). This Pi-Top + RSP combination could form the basis for any number of educational or research projects alongside bespoke Raspberry Pi software controlling the full functionality of an RSP.